Now she has no choice but to run—from the dangerous operatives who want her terminated because she knows too much and from a mysterious group that wants to capture her alive and unlock her advanced technology. 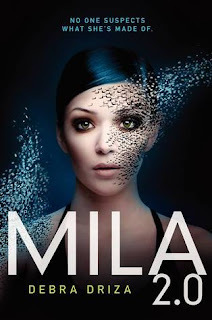 However, what Mila is becoming is beyond anyone’s imagination, including her own, and it just might save her life. Awww I hope you get it, crossing my fingers for you! Sadly, I was declined *sobs* but I still really want to read it :D I'm eager to read your thoughts on the novella! I'm really looking forward to reading this one, I think I get more excited the more I see it. Great pick! I loved this one and hope you do too. Hope you get to read it soon! Oh I'm thrilled you loved it Brandi :D And thanks!! I totally agree, I am so anxious to start this one. Before I haven't had the best experience with Sci-Fi but lately ally he sci-fi books I read I tend to enjoy! Looks so good ~ can't wait! Yes YES! I am really loving this recent upswing in popularity sci fi has been seeing in YA lately. I know a lot of people feel like it's out of their comfort zones, but I usually fall in love with the concept and world building. Mila 2.0 sounds super exciting!! Really love the cover, too. I am really excited for this one too. It sounds awesome!! Great pick.